The US dollar lost some traction today after a batch of mixed economic news. The greenback fell against the euro, the Japanese yen and the pound pulling back some of yesterday’s strong gains. Activity was subdued though with most traders waiting on tomorrow’s nonfarm payrolls before placing trades of any size. 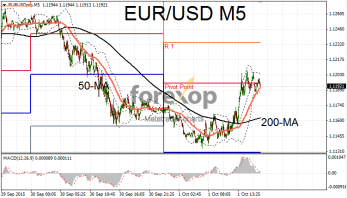 EUR/USD rose nearly 0.5 percent as traders got sight of the day’s economic releases. 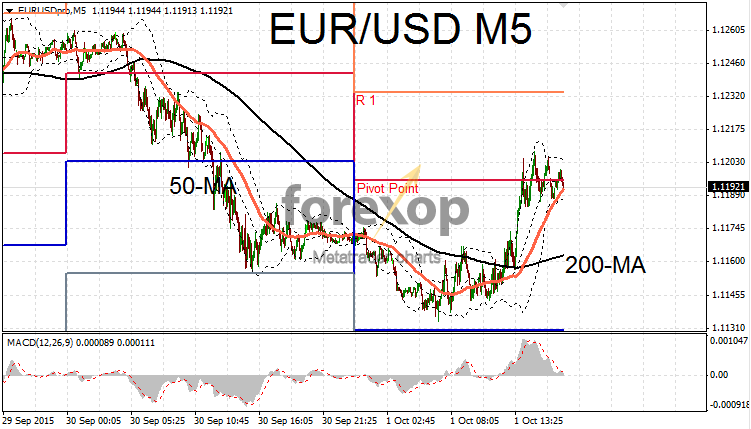 But after a strong bounce EUR/USD failed to break cleanly above 1.12 and build on the rally. Momentum dropped and the pair is now consolidating around the top of the 1.11 range. On the daily timeframe the move wasn’t significant and EUR/USD remains in sideways consolidation over that period. The negative sentiment on the dollar was set early on after a disappointing set of figures from the manufacturing side. US manufacturing has flatly failed to partake in the economic upturn. ISM’s purchasing managers’ index for September fell to a two year low. The closely watched index came in at 50.2 just above the level which denotes expansion. Activity in eleven of the eighteen categories fell over the month. Exports also slipped over the period. On the plus Markit reported a small increase in their monthly survey with a rise to 53.1 from 53 in August. Manufacturing industries have struggled over the past two years against headwinds caused by a rising dollar and weakening commodities market. Adding further to this is the slowdown in emerging economies, prominently China. Today’s data reinforced a trend that’s been ongoing for the past two years. Employment, the bright spot in the US economic recovery also received a blow today. At 277,000 for the week, new claims for state unemployment support were at the top end of forecasts. The latest data makes a rise of 10,000. The weekly figures are generally volatility though and any figure below the 300,000 mark is seen as acceptable at this point in the economic cycle. On the other side of the Atlantic, Germany’s manufacturing sector showed further signs of slowing today. September’s purchasing managers’ index came in at the low end with a reading of 52.3. That’s down from 52.5 a month earlier. Some improvements in French manufacturing though helped level the PMI reading for the entire Eurozone and this came in bang on target at 52.